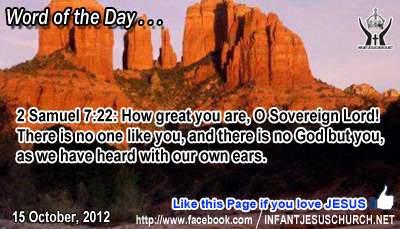 2 Samuel 7:22: How great you are, O Sovereign Lord! There is no one like you, and there is no God but you, as we have heard with our own ears. Heavenly Father, we hold you in the highest place in our heart. Forgive us when we do not hold you in the highest place in our life. Allow us with your Holy Spirit to give up all the small things that distract our loyalty to you and interfere with you being the highest and Sovereign God in our day to day life. In Infant Jesus' name. Amen. Jesus came to set us free from slavery of sin and upsetting desires. Through the gift of the Holy Spirit he pours his love into each one of us hearts that we may appreciate his will for our lives and walk in his way of sanctity. God searches our hearts, not to condemn us, but to show us where we require his saving grace and help. He calls us to look for him with true regret, humility, and the sincerity to see our sins for what they really are a refusal of his love and will for our lives. God will change us if we listen to his word and allow his Holy Spirit to work in our lives. Ask the Lord to renew your mind and to increase your thirst for his wisdom. A double-minded person cannot get this kind of wisdom. The single of heart wish one thing alone – God's happiness. God wants us to joy in him and to know the liberty of his truth and love. “Loving Infant Jesus, give us a heart that loves what is good and in harmony with your will and fill us with your understanding that we may understand your ways. Give us the grace and the guts to reject whatever is evil and opposing to your will.